When I was about six years old, my mother took me to some sort of flea market deal and had me sit perfectly still for a photo of my profile. The woman turned my photo into a black silhouette. My mom LOVED it. I remember thinking it was silly, asking her why she liked it because I had no face. Now I totally get it. 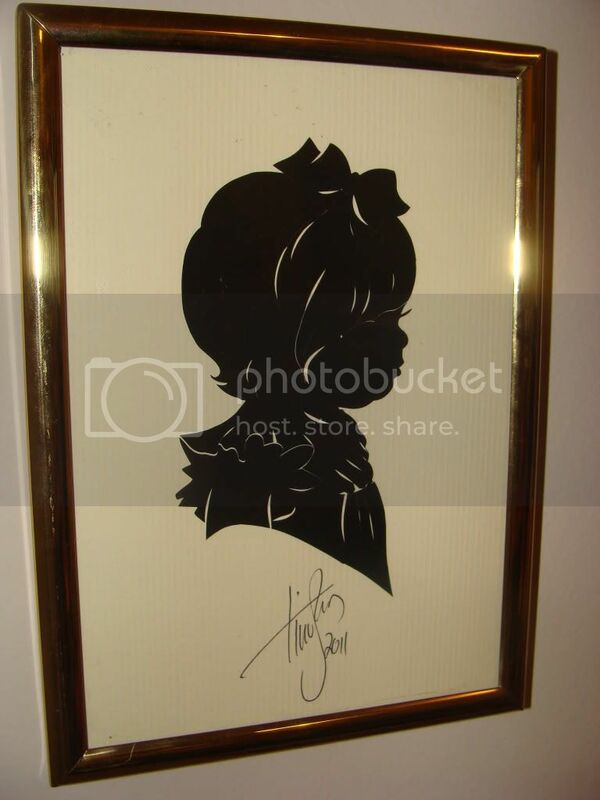 One of my most prized possessions is my daughter's silhouette picture. When I heard that Tim "The Silhouette Man" Arnold was coming to a kid store in town, I made an appointment as fast as my fingers could dial the phone number. I didn't do my research on Mr. Arnold, I just saw silhouette, and wanted to get one before my daughter lost her baby fat. When I arrived, to my astonishment, he had my little queen sit in my lap, told me it didn't matter if she was still or not, and began cutting out her profile from two pieces of black paper with a pair of scissors. Not what I was expecting at all. My child was moving nonstop, but he cut out her exact profile, even down to her double chin and button nose. And, to top it off, he did this in about two minutes. I was shocked. Squeals of delight, shocked. He handed me two profile cutouts, I told him that he was a true artist, and I was on my way. Ten minutes, tops. He also does mail orders on his website. Just send in a photo, and he sends it back with the silhouettes. Simply beautiful. I will treasure this forever. Thanks for the kind words. I have a really fun job. Kidding kids and capturing memories in in black paper. God Bless! No, thank you. I can't express my love for this profile of my child cut into black paper. You captured her in one of my very favorite stages. Thank you so very, very much.